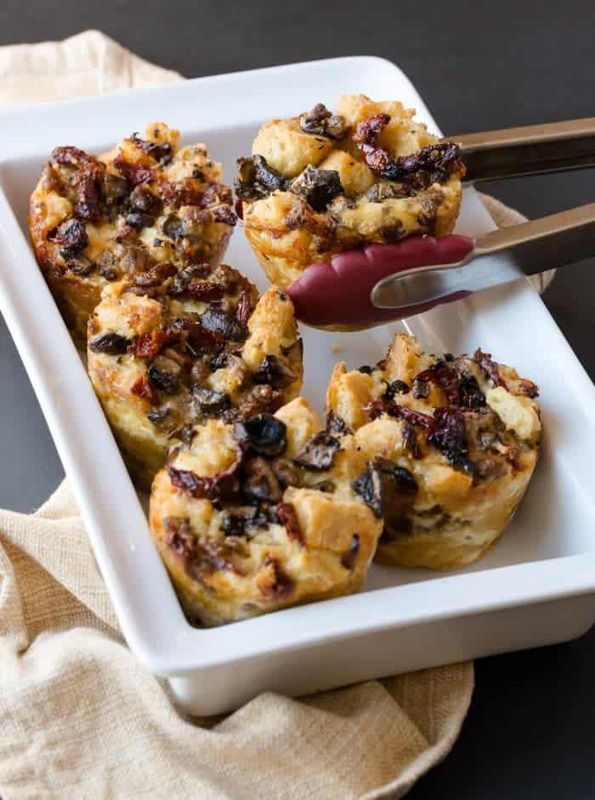 These individual Tuscan Stratas can be made ahead of time – perfect for breakfast, brunch or even brinner! I’m always looking for an excuse to make brunch – and Easter is a perfect time for that with these Tuscan Stratas. These individual stratas are made with a Tuscan seasoning blend that takes it a step above the run-of-the-mill egg bake. Start with a great mild Italian sausage. Add some sun-dried tomatoes for a delightful pop of flavor and nestle them in gooey Fontina cheese. I love that the ingredient list in this recipe is a little off the beaten path of typical egg bakes. You can easily substitute the Fontina and Asiago for another cheese you have on hand, and it will still be fabulous, but step outside of the box a little and try something new. Your taste buds will love it. Ever the fan of prepping ahead of time and individual portions, this hits the bulls-eye on both. Make it the day before and let the bread soak up the eggs and seasonings. Pull it out of the fridge in the morning and pop it in the oven. Can entertaining a crowd get any easier? Add some fruit and you have an outstanding brunch – and you did it the low-stress way by staying out of the kitchen when your guests are there. What are your favorite make-ahead menus for brunch? Place cubed bread in large mixing bowl. Heat oil in large skillet over medium heat. Saute sausage, onions, seasoning, salt and pepper until sausage is no longer pink (8-10 minutes). Add sausage mixture to bread cubes. In same skillet melt butter; sauté mushrooms until all liquid evaporates. Stir in garlic and sun dried tomatoes; cook 1-2 minutes longer. Add mushroom mixture to bowl with bread and sausage. In another mixing bowl whisk eggs and half and half. Stir in hot pepper sauce and cheeses. Pour egg mixture into bowl with bread-sausage mixture; mix thoroughly. Spray jumbo muffin tin with cooking spray. Spoon egg mixture into muffin cups. Refrigerate covered overnight. Preheat oven to 350 degrees. Remove stratas from refrigerator 30 minutes before baking. Bake uncovered for about 30 minutes or until knife inserted in center comes out clean. 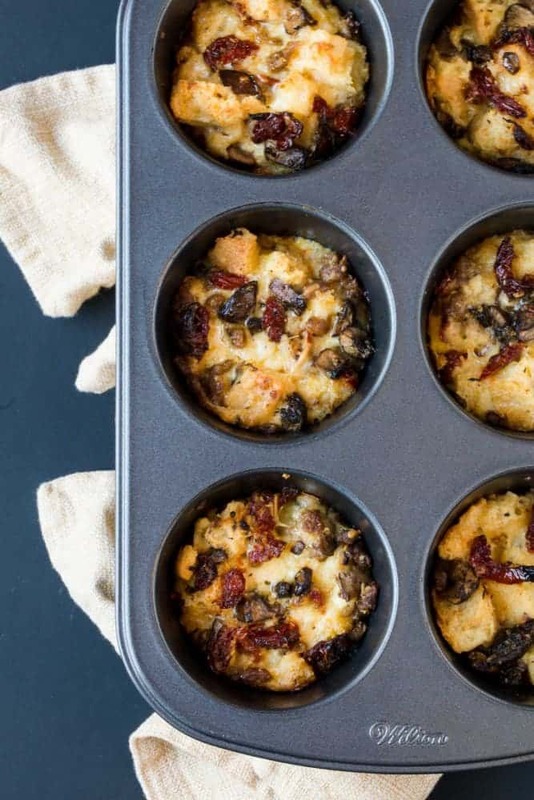 Remove from oven and allow to sit 10 minutes before removing from muffin tins. These are beautiful and perfect for an Easter brunch or any brunch for that matter! Hi Shelly, I haven’t made them and frozen them so I can’t say how it would work. Let me know how it turns out if you do it. I would love the feedback. Thanks for your note!